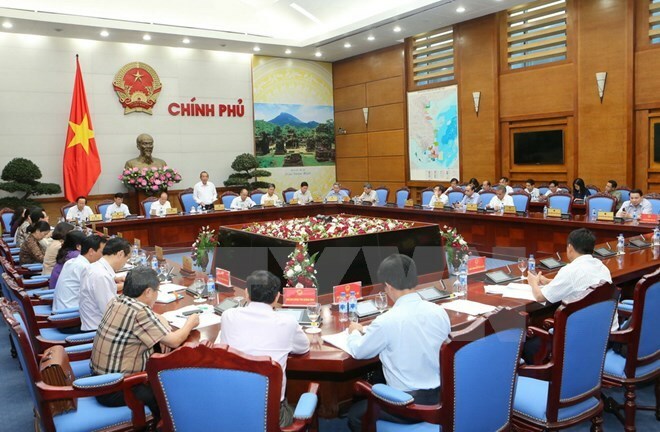 Hanoi (VNA) – Deputy Prime Minister Truong Hoa Binh has urged that compensation for four central coastal provinces hit by marine incident must ensure openness, transparency and democracy. Chairing the ninth session of the Steering Committee for marine incident recovery in Hanoi on August 21, Binh said Taiwan’s Hung Nghiep Formosa Ha Tinh steel company, which accepted responsibility for causing last year’s mass fish deaths in four central provinces, basically fixed 52 flaws, restored production and joined social activities. He demanded that its manufacturing activities continue to be closely monitored to prevent violations. On compensation for rising fisheries inventories, provincial authorities and the Ministry of Industry and Trade were asked to inspect the situation to report to him this month, adding that the origin of seafood must be clear when it comes to seeking compensation. Deputy Minister of Agriculture and Rural Development Vu Van Tam reported that as of August 18, as much as 5.95 trillion VND in compensation was provided for victims, or 94.3 percent of total damages. The remaining amount was due to the absence of victims from their residence or pending appeals from victims. According to the Ministry of Agriculture and Rural Development, the four provinces are asking for additional compensation worth 563.17 billion VND (24.48 million USD). Meanwhile, the total seafood in stock has so far amounted to 11,751 tonnes, or a 2.2-fold increase compared from 5,369 tonnes reported by the Health Ministry. Localities have approved compensation for 6,226 tonnes. The MARD proposed setting up an inter-ministry team to inspect the declaration of stockpile seafood. At the same time, the ministry rejected a proposal to offer preferential loans to build 400 new fishing vessels in the four provinces. Instead, funds should be used to build fishing infrastructure to benefit fishermen community. The idea won approval from other ministries and local authorities.